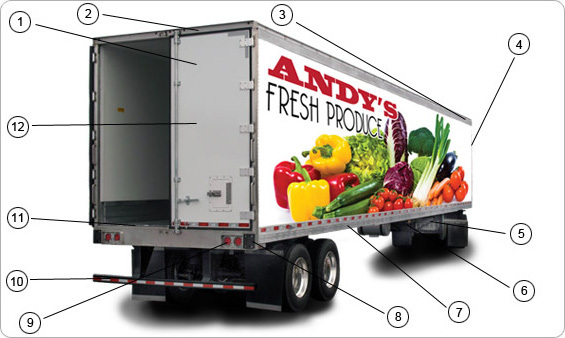 Uniquely designed to protect perishable products while reducing operational costs. Uniquely designed composite panel rear door is highly durable and easily repaired, standard with five hinges that are equally spaced top to bottom. Doors are equipped with Kidron's patented pillow and integral wiper seals. Our full width stainless steel rear frame is strong enough to withstand the rigors of dock delivery and features a standard 5-light rear header. Choose from a one-piece nose rail or a three-piece nose rail with high-strength aluminum corner casting that resists damage upon impact and protects high-visibility lighting. High strength steel refrigeration frame features G-member construction, providing omini-directional strength and stiffness. Upper coupler is designed to meet the stresses of a high frequency drop and hook operation. A one-piece approach plate and six front stanchion plates prevent approach plate dishing. Our AAR-rated kingpin features eight kingpin stanchion plates for signiá¼€cant added strength over this critical contact area. Designed for internal undercoating to further resist corrosion. Dock bumpers feature a 6 by 8-inch rubber bumper, placed outboard on a 3/16 by 8-inch stainless steel doubler plate. The assembly properly directs forces associated with dock shock and protects against bottom rail damage. A 3/8-inch stainless steel eyebrow protects the recessed lights. Standard bolt-on rear impact guard's durable design exceeds industry standards. Kidron's standard floor system features our unique forklift reinforcement package with full width integral 50-inch aluminum I-beam and plate reinforcements.